Two nearly identical drinks, born decades apart, both worth visiting (or revisiting) for their simple deliciousness. I’ll make this quick. First, the classic: the Brown Derby. Vendome Club, Hollywood, 1930s; Douglas Fairbanks at the bar. We don’t even know what class is anymore. Shake with ice, strain into chilled cocktail glass. For honey syrup, mix equal parts honey and hot water, stir until honey is fully dissolved. I sometimes go for a year between Brown Derby cocktails, and every time I do I wonder why it’s been so long since the last time I had one. While rye is shouldering its way back into cocktail prominence, this drink is more relaxed, with the richness of honey, so the casual sweetness of bourbon is right at home. The drink is so easy to make, and the flavor is nothing elaborate, but neither is that of a daiquiri or a margarita, and how often do you visit those wells? I mixed a Brown Derby last night; remind me before another year passes that I should come back to this one again soon. Next: the newcomer. I completely missed the Honey Fitz at Tales of the Cocktail this year. Created by Jackson Cannon from Eastern Standard in Boston, the Honey Fitz is a nod to Boston’s political heritage: John F. “Honey Fitz” Fitzgerald was a congressman and mayor of Boston this time last century, and grandfather to JFK, RFK & EMK. I didn’t make it to the Diageo Happy Hour at Tales this year, so I didn’t have a chance to try the drink from Jackson, so I had to wait until I was back home to come across the recipe. Fred blogged about this drink back in August, and the recipe was carried into Zig Zag one night by Alex, a local cocktail geek and a regular. One night at the bar, Alex introduced me to the Honey Fitz, for which I owe him my undying gratitude. Zacapa was practically made to be mixed with honey. 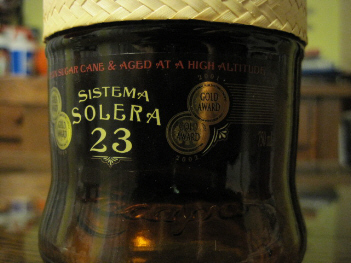 Already rich and luscious, the rum merges perfectly with the musky tang of honey. Grapefruit seems less acidic than lime or lemon, which would have given the drink a sharper edge, but the grapefruit leavens the sweetness just enough, while rounding out the flavor and giving the drink some brightness. It’s somewhat sweet, true, but not cloying or syrupy; the Honey Fitz is just extremely tasty and goes down way too easy. This is perfect timing. I have a bunch of fresh grapefruit in my fridge and need some new recipes ro try them with. Brown Derby, here I come! As the Alex in post, thank for the the nod! I am very glad you enjoyed the Honey Fitz as much as I did. Your description was both vivid and incredibly spot on. Hope to see you back there again soon. It’s been a while! 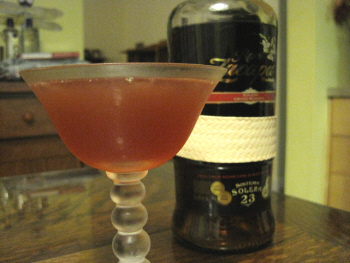 fyi – have made similar drink called the red maple that i think you would like even more. same proportions as honey fitz, but sub smith and cross as the rum and maple syrup for the honey and bang.